Finally, odor free incontinence disposal at home! Contrary to regular trash cans, The Akord Discreet Disposal Pail is exclusively designed for disposal of incontinence products. The unique internal trap doors help contain odors, while still allowing a simple step and drop operation. Truly Hands Free"_Just Step and Drop! Akord pails offer you hygienic, hands free disposal of incontinence products. Simply step on the pedal to open the lid, then drop your incontinence products through the trap doors and you are done. Easy to Use Because Akord uses a long, continuous liner refill, emptying is very easy. Just open the front access door, cut the liner with the door mounted cutter, and then tie a knot at the end of the liner to form your next bag. The refill is easy to replace when empty. Akord comes ready to use right out of the box with one refill already installed for you. 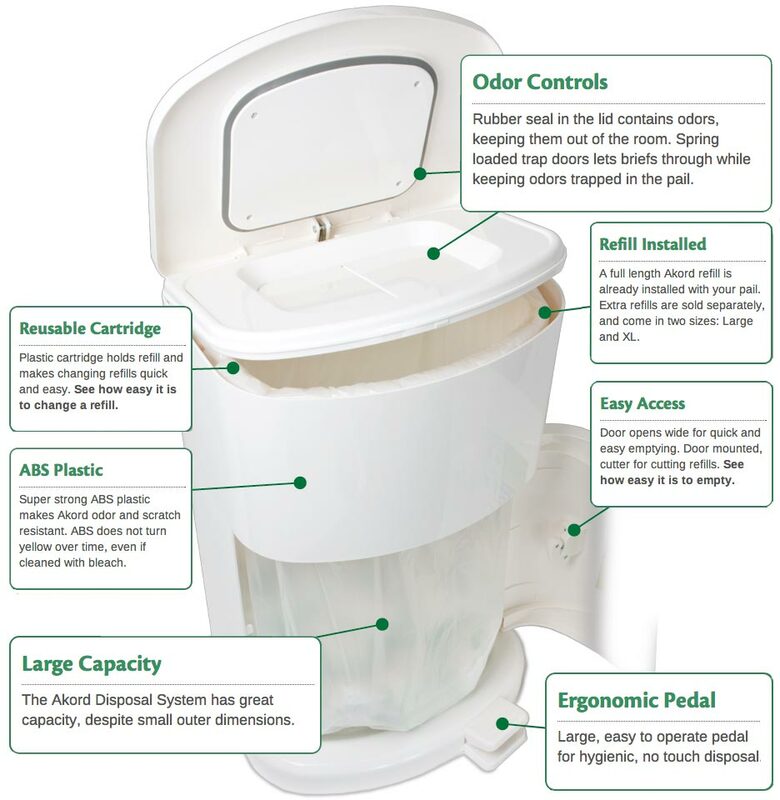 The Large Akord Disposal System holds up to 10 small or medium incontinence products and the X-Large Akord Disposal System holds up to 12 large or x-large products.